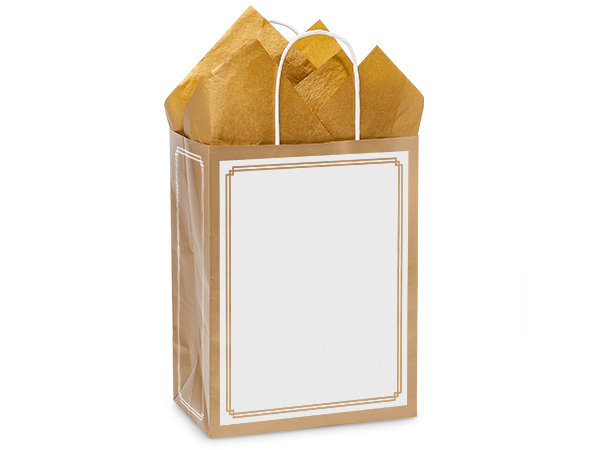 Cub Gold & White Duets Bags 25 Pk 8-1/4x4-3/4x10-1/2"
Cub size Metallic Gold & White Duets paper shopping bags sold by the 25-Pack are made from 40% recycled gloss white paper. Bags are 100% recyclable and made with a minimum of 40% post consumer recycled content. A Green Way ® - Packaging with Purpose brand product. Made in the USA.